Excellent analysis by LCdr Hilger. 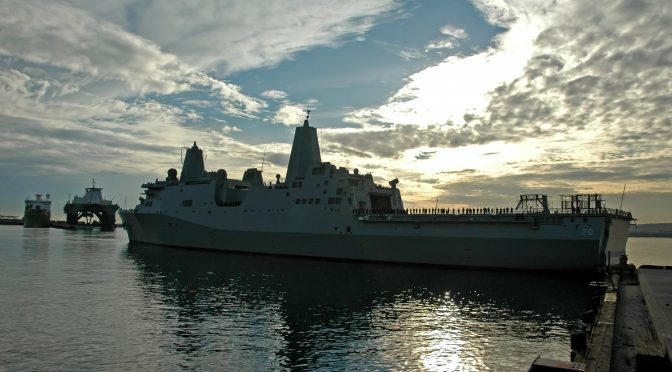 He put his finger precisely on the principal reason why the US Navy has relatively few but very expensive ships – not just amphibs, but all ship classes: the neverending quest to stuff more and more gear into Navy ships, as if cost were not a factor or a performance objective. Cost is just like any other performance objective – i.e, speed, range, firepower, and sensor capability. There is obviously a need for high end capability in at least some ships, but no nation can afford to have an entire navy consist only of high end ships, with more and bigger and better everything on board. The US Navy needs to do a better job of prioritizing performance objectives, including cost. That process has already begun with the design of FFGX, where cost was explicitly stated as a top level performance objective. The development of unmanned vessels similarly is largely about “getting more bang for the buck”. So similarly the gator navy needs to follow the same paradigm. Stop thinking about all the top line combatant warship capabilities – like VLS and ASCM launchers and top line air defense radars – that can be stuffed into an amphib ..leave those capabilities to the escorts .. and then build better resilience into the amphibs should they take any ASCM hits. And minimizing crew size must be a key element of cost containment. Large crews not only cost a lot of taxpayer money to recruit, train, qualify, and retain, but they also consume a great deal of hull volume and hotel/environmental support capability. Automate and simplify the ship designs. Follow the lead of not only LCS and the Zumwalts, but also the Ford CVN, which cut the Nimitz crew size by 1/3. Similarly our SSNs have been bloated over the last three decades while gaining in capability only marginally .. they need to be slimmed down and made cheaper too, or we’ll never achieve the 66 SSN fleet the Navy says it needs. that while 75-100 may be on watch at any ONE time – the day is 24 HOURS and fatige sets in quickly while on watch and you need enough Sailors to stand watch 24/7 while underway. Leaning the crews is NOT working on LCS, DDG1000 or anywhere else. If crew sizes are going to be decreased then watch requirements must ALSO be decreased across the board. You are absolutely wrong. Leaning the crews absolutely IS working out great on the newest ships .. so well that Admiral Boxall, Surface Warfare Director stated that the decision has already been made to go with leaner crews, with much greater automation, on both FFGX and all the next gen combatants, combining that with Blue Gold crewing creates much better trained crews, much fresher, and better prepared to sail their ships on very long deployments. The same is happening on the Ford CVNs as well as the Zumwalts. You can’t simply cut the crew size with the same equipment .. the ships have to be designed from keel to antenna mast to be more automated, with highly engineered streamlined process designs that simply require fewer warm bodies. Today we have already proved we can send an unmanned ship out on the seas for a 7,000 mile round trip and do it safely. The notion that we somehow need hundreds of warm bodies to operate ships that merchantmen can operate with crews of 2 dozen ought to seem ridiculous enough already. I agree with both of you. It’s possible to leverage technology to reduce manning and get the same operational impact. But, the requirements – whether for numbers of people on watch, numbers of people manning a detail, administrative requirements, training requirements, collateral duties, etc. – need to be adjusted accordingly. There are three big differences behind the manning of active-duty ships and merchant ships. First: active-duty ships have far more missions. Commercial ships generally only transit and deliver products. Active-duty ships are designed for multiple simultaneous offensive and defensive missions, all while still transiting (navigation/engineering requirements). Second: active-duty ships are designed to take damage and keep operating/fighting. As such, they have to have a lot of extra bodies on board, so a certain percentage can be lost as casualties with minimal impact to the ship’s fighting capabilities. Third: On active-duty ships, the ship is a training environment. Sailors largely arrive untrained, inexperienced, and unqualified, and spend much of a 2-4 year tour conducting OJT. By the time they know their job, it’s nearly time to rotate elsewhere. In contrast, on commercial ships, mariners complete nearly all training and qualification in the schoolhouse and arrive ready to assume their duties, unaided, within 24 hours of reporting aboard. Many times, I’ve seen assumptions about minimal manning fall apart when they weren’t properly developed throughout the larger organization. For example, removing personnel from ships with the assumption all maintenance/repair is conducted by contractors or shoreside personnel only works if those pierside people actually exist, and are allocated all the extra time/money to take on the ship maintenance. In another case, it was forgotten that ships still needed to be cleaned and to have stores loaded – tasks typically performed by unskilled junior personnel. When those personnel were eliminated, highly skilled personnel were unable to perform their assigned duties because they were called away to load stores and keep the ship sanitary. I’ve served on “traditionally” manned military ships, newer “optimally” manned ones, “up-manned” ones in combat zones, and on civilian ships, and I’ve cross-decked to a number of coalition naval ships. It’s entirely possible to rework the manning structure of military ships to take advantage of technology, but the entire larger picture needs to be redesigned at the same time, or the experiment risks falling apart on the backs of overworked sailors. DDG-1000 annual operating cost exceed CG-47 and LCS exceed SSN and are right around an LPD or DDG. Go read the SARs and budget. Crews are the largest component of any manned ship’s operating cost. Budget docs are poor sources of info as they combine all kinds of accounts that are not particular to a given hull.